Kerala is a world of serenity and natural beauty. The coastal regions of Kerala have a network of waterways, inlets from the sea, estuaries, lakes and natural canals connecting coastal towns. This interlinked body of waterways is known as the backwaters in Kerala. See the green countryside, swaying palm trees, emerald rice fields. Backwaters are the most popular tourist attraction of kerala. 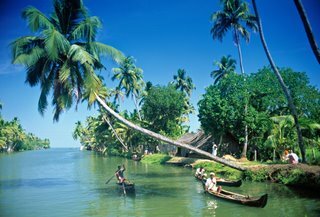 The backwaters stretch over fifteen hundred kilometers are covered with swinging palm trees. Over 900 Km of the Kerala backwaters are navigable and have been used for centuries by the local people for transportation. You can travel on these waterways on a traditional houseboat and enjoy the scenic beauty of the backwaters in Kerala. Some of the famous backwaters of Kerala are Alappuzha Backwaters, Kuttanad Backwaters, Kottayam Backwaters, Kollam Backwaters, Kochi Backwaters, Kumarakom Backwaters, Malappuram Backwaters etc.Alapuzha is often the starting-point of the boat cruise through these backwaters as one reaches the land of Kuttanad, also known as the rice bowl of Kerala because of its paddy fields.You can enjoy snake boat races on the backwaters of Kuttanad. Kumarakom has a spectacular lagoon to behold and coconut trees have become icons of Kerala tourism industry.Kollam's lagoons, rivers and lakes are delightful and Kayamkulam and Ashtamudi Lakes are some of the most visited tourist spots here. The entire experience of the green and serene backwaters of Kerala is incomparable. You must opt for the fabulous ride on the houseboat and explore the fascinating beauty of the backwaters of Kerala.